The Great War of 1914-1918 confronted the United States with one of the most wrenching crises in the nation's history. It also left a residue of disruption and disillusion that spawned an even more ruinous conflict scarcely a generation later. Over Here is the single most comprehensive discussion of the impact of World War I on American society. 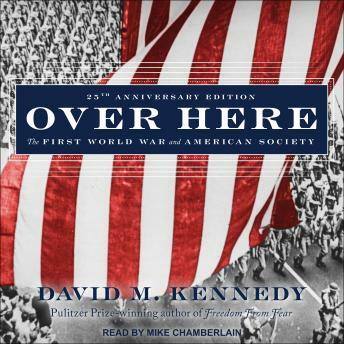 This twenty-fifth anniversary edition includes a new afterword from Pulitzer Prize-winning author David M. Kennedy, that explains his reasons for writing the original edition as well as his opinions on the legacy of Wilsonian idealism, most recently reflected in President George W. Bush's national security strategy. More than a chronicle of the war years, Over Here uses the record of America's experience in the Great War as a prism through which to view early twentieth-century American society. The ways in which America mobilized for the war, chose to fight it, and then went about the business of enshrining it in memory all indicate important aspects of enduring American character. An American history classic, Over Here reflects on a society's struggle with the pains of war, and offers trenchant insights into the birth of modern America.